After only 1,5 years of use Celine has outgrown her first balancebike. Sadly I bought her one that couldn’t be adapted to a growing toddler. One height, that’s it. Still to big when I gifted it to her, at the age of two. I wish I would have seen the littlebigbike on my search back then. It grows with your child from the age of 2 up to around the age of 7. From a low balance bike, to a higher balance bike and finally you can convert it to be a pedalbike. I ordered the bike earlier in december, as it was going to be our big Christmas gift for Celine. Due to a storm the shipment arrived late, but littlebigbikes made sure the package would still arrive in time for Christmas Eve. I’m really amazed by the great customer service. They kept me updated at all times, about the arrival of the parts, the assembling in Ireland and after it’s arrival they answered all of my questions quickly (within a day!). Assembling was not very hard, but it’s easy for me to say as I let my dad do that part (that’s what being a grandpa is about, right?). 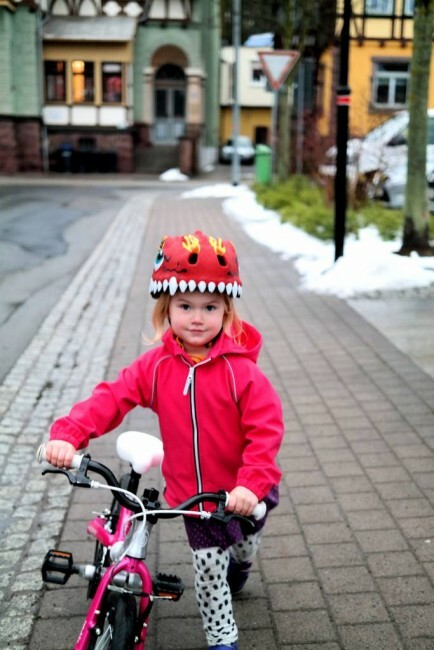 Celine started with the ‘big’ balance bike option. 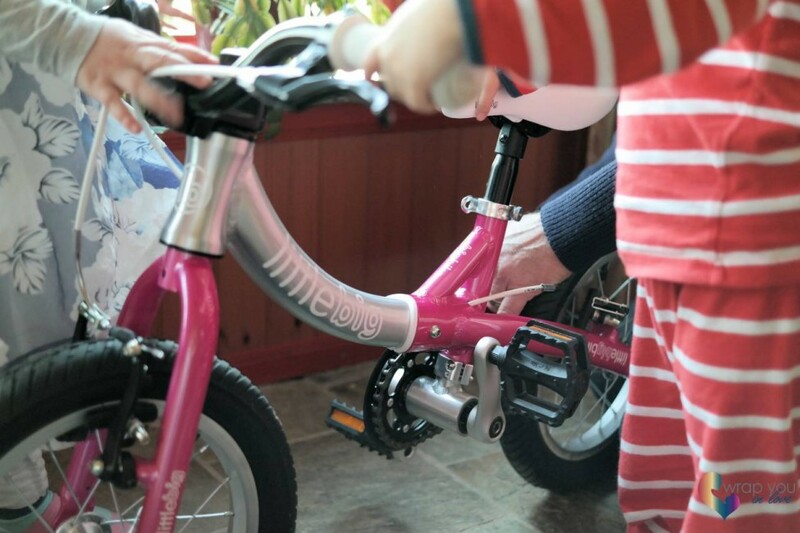 You can turn the rear-end of the frame over for it to be a ‘little’ balance bike, this will lower the saddle and decrease the handlebar reach. This would be the right start for a 2 – 3 year old. Celine will turn 5 next month, so she didn’t need that option anymore. You can easily adjust the saddle height just like a normal adult bike, no tools needed. The innovative frame design & sustainability of the bike also convinced the jury and the littlebigbike won a honourable mention at the Red Dot (design) awards in 2015. Eventhough it’s like a big bike, it’s a lightweight. Weighing a little over 5kg as a balance bike and 6.6kg as a pedal bike, it’s easy to handle for a small child. I’ve compared the weight with a German brand which is probably the best selling children’s bike brand over here and their aluminium bikes for age 3+ weighs 8kg. Just as a comparison. Yes, compared to some balance bikes the 5kg is heavy (I’ve seen balance bikes with a weight around 4kg), but I think it’s a weight a 2 or 3 year old can learn to handle without any problems. Celine really wanted to learn how to ride a real bike. I wanted to wait until her birthday, but I finally gave in. She’s still a bit too small to reach the ground comfortably with her feet when she’s on the saddle (if the pedals are added to the bike), but this didn’t stop her from riding off. She just needed my help when getting on to the bike, but steering, handling and even braking was no problem for my little big girl. Just imagine Celine on a bike saying ‘quicker, mama, quicker!’, with me running after her. Must have been quite a sight. Well, at least she had fun! There’s enough room for her to grow and enjoy the bike for a few years (hopefully). When she outgrows the bike, I’m sure it will be loved by Alice. 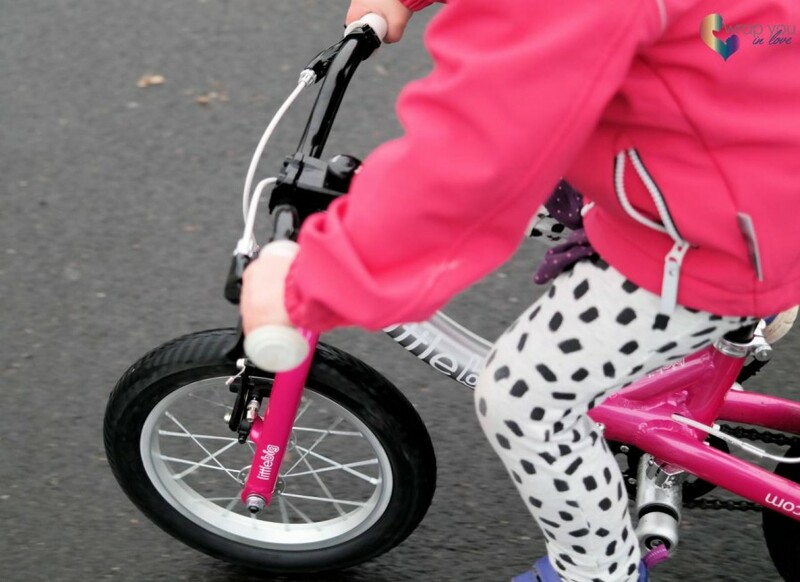 This sparkling pink bike already made Alice a bit jealous. For those who don’t love pink as much as we do, it’s also available in green, blue and red. With a price of 250euro it might seem expensive, but you save yourself the money of buying two bikes. 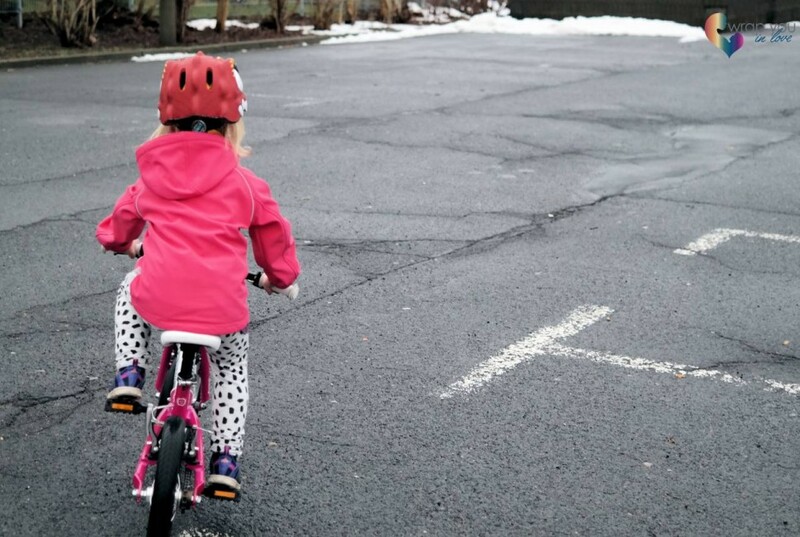 Buying a balance bike AND a pedal bike will probably get more expensive. The bike comes with a 30 day money back guarantee, if it doesn’t meet your expectations you can return it (in saleable condition) and get a full refund. The person behind the brand, Simon Evans, has cycled around the world, is a designer & an engineer. His experience with bikes obviously shows in the quality of his product. And some good news, I have a code for 10€ discount to share with you all! Use the code ‘wrapyouinlove‘ on your purchase at their website.